"A stylish Irish Belleek porcelain cream jug and sugar bowl - beautifully made, at the world famous County Fermanagh pottery works Ireland. 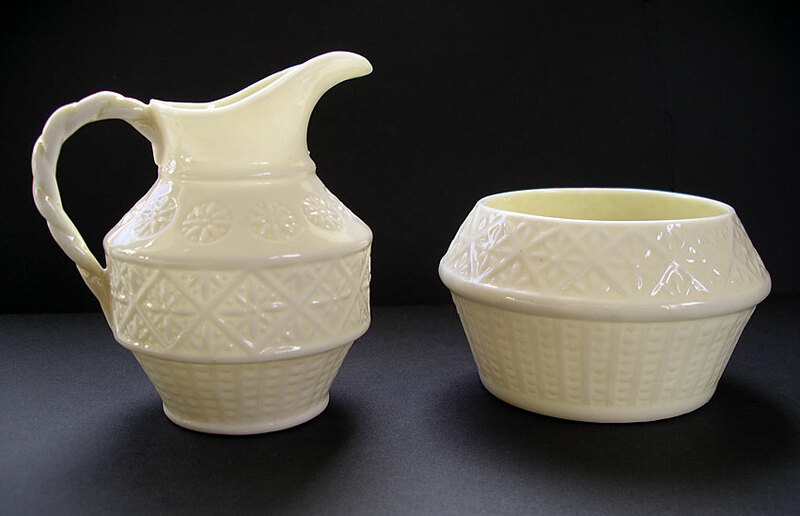 Another Belleek pottery original design with rope twist handle to jug and impressed relief design of basket weave trellis patterns and stylised flower heads. It is known as the Cleary pattern. One of the best Belleek jug and bowl designs in our opinion. A lovely display set to add to your best Irish china cabinet display." Antiques Expert Hamilton Bear. Marks: Second Black mark to both pieces dating c.1926-46. Condition: In excellent display condition with no damage or restoration.